BOSTON - A right whale found dead in waters near Cape Cod this week has been identified as a frequent visitor to the area that was first spotted off the Cape in 1992. The Cape Cod Times reports the 26-year-old female whale named Couplet was identified Thursday through photos in a database at the New England Aquarium. PORTLAND, Maine - Marine conservation groups say accidental deaths this year among the endangered North Atlantic right whales threaten the species survival. 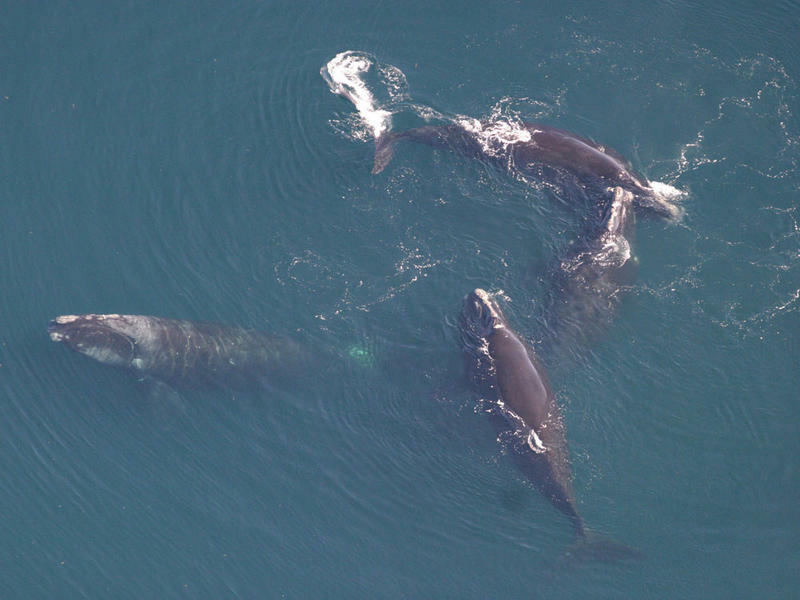 Right whales are among the most imperiled marine mammals on Earth. No more than 500 of them still exist in the wild. Biologist Regina Asmutis-Silvia says at least 12 whales have died since April, or about 2 percent of the population in just a few months. PORTLAND, Maine - The National Oceanic and Atmospheric Administration says rare right whales will be considered for disentanglement from fishing gear on a "case by case basis'' in the future. The agency suspended efforts to free whales tangled in fishing line last week after a Canadian rescuer was killed by a right whale after freeing it. It has since announced that whale disentanglement will go forward, with rescue teams resuming most operations. The National Oceanic and Atmospheric Administration says it will resume most of its whale disentanglement operations. However, rescues operations for entangled right whales, a highly endangered species, will be considered on a case-by-case basis depending on circumstances and the availability of responders with the highest level of training. The agency is singling out right whales because of what NOAA Fisheries Assistant Administrator Chris Oliver says is the unpredictable behavior of right whales which can be particularly challenging during rescue attempts. BOSTON - Scientists say six endangered North Atlantic right whales have died in Canadian waters over the past three weeks. North Atlantic right whales are one of the most endangered large mammals on Earth, with only about 500 still alive. Scientists with Anderson Cabot Center for Ocean Life at the New England Aquarium in Boston and Woods Hole Oceanographic Institution on Cape Cod say they're alarmed by the high number of deaths. FALMOUTH, Massachusetts - Scientists on Cape Cod say they have located a pair of right whales that had been presumed dead after not being sighted for many years. 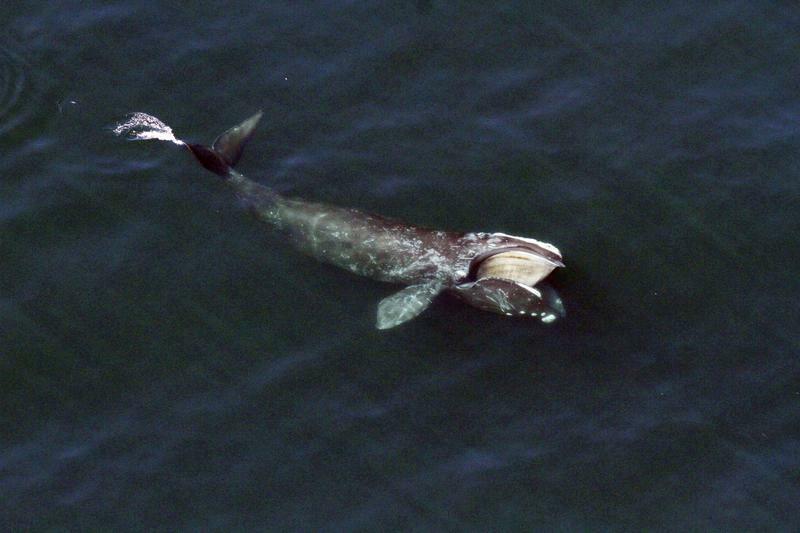 The National Oceanic and Atmospheric Administration says an aerial survey team found a new right whale mother and calf feeding in the Great South Channel off of Massachusetts on Sunday. The whale is one of two that have been added back to the population by scientists this year. The other whale was also part of a new mom and calf pair and was sighted within the last two weeks. BOSTON - Those endangered North Atlantic right whales cavorting in Cape Cod Bay are fun to watch, but their frolicking doesn't tell the whole story. Charles "Stormy'' Mayo is director of right whale ecology at the federally funded Center for Coastal Studies in Provincetown, Massachusetts. Mayo says ominous signs suggest the global population of 500 animals is slowly declining. This time last year, he and other experts thought the population might be incrementally rebounding. 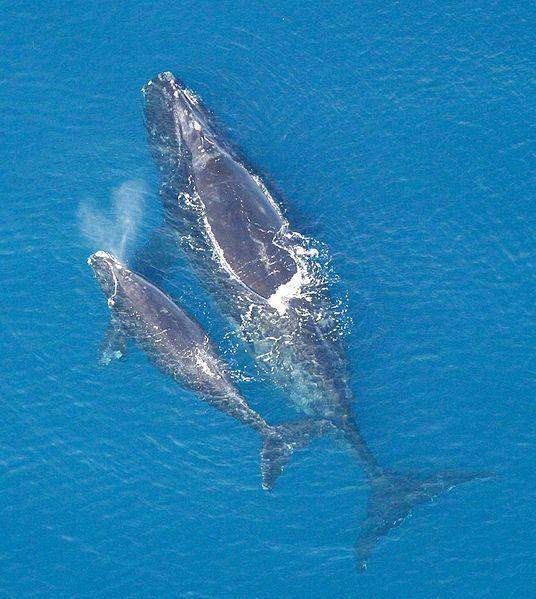 Right whales are among the rarest creatures on the planet. PROVINCETOWN, Mass. - Coastal researchers in Massachusetts say they found more endangered right whales in Cape Cod Bay recently than on any one day in recent history. A spokeswoman for the Center for Coastal Studies says researchers found 112 of the rare whales in the bay Sunday. The spokeswoman says the next highest number for one day was 96 in 2014. BOURNE, Mass. — Endangered right whales increasingly are frequenting Cape Cod Bay, enticed by the fine dining possibilities of its plankton-rich waters. Experts tracking the majestic mammals — among the rarest creatures on the planet — say nearly half the estimated global population of 500 or so animals has been spotted in the busy bay over the past few springs. PORTLAND, Maine - The federal government is expanding habitat for endangered North Atlantic right whales to include more feeding and birthing areas. The National Oceanic and Atmospheric Administration says the expansion will cover the whales' northeast feeding areas in the Gulf of Maine and Georges Bank and southeast calving grounds from North Carolina to Florida. The agency says the new rules do not add new restrictions or management measures for commercial fishermen. PORTLAND, Maine - Federal fishing regulators say researchers have identified 61 critically-endangered right whales in Cape Cod Bay, including four mothers with calves. NOAA Fisheries officials say the whales were spotted in the past two weeks through aerial surveys. The agency is asking boaters and fishermen to keep an eye out for the whales and go slow in the area. There's already been one report of a possible whale/boat collision near the western shore of the bay. PORTLAND, Maine - The National Oceanic and Atmospheric Administration is reminding recreational boaters to slow down for right whales or face substantial penalties. The agency says it charged four large yachts with violations for traveling at speeds greater than 10 knots in right whale management areas last year. Penalties for the violations ranged from $9,000 to $11,500. North Atlantic right whales are critically endangered and their western North Atlantic population is only about 450. 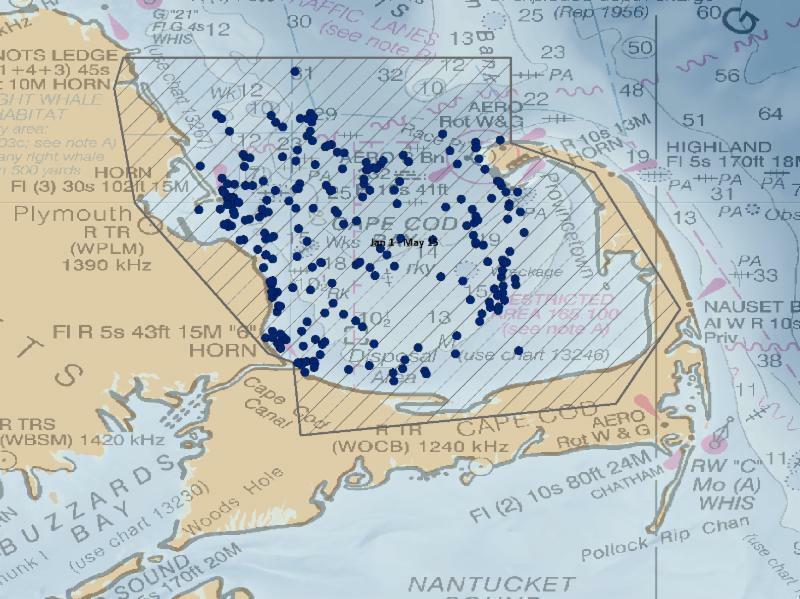 WASHINGTON - Federal officials are proposing a significant expansion in the critical habitat for endangered North Atlantic right whales in the northwestern Atlantic Ocean. NOAA Fisheries want to increase the designated area - which stretches from the Gulf of Maine-George's Bank region, down to northern Florida - to almost 30,000 square nautical miles. That's an expansion of more than 600 percent. Maine lobstermen are considering taking the federal government to court over regulations designed to protect endangered North Atlantic right whales. The Maine Lobstering Union has filed a notice of intent to sue the National Marine Fisheries Service over new and existing rules requiring the modification of lobster gear. The union argues that the rules put fishermen at greater risk of accident and injury, while offering little proven protection for the whale population. But not everyone in Maine's lobstering community thinks a lawsuit is a good idea.